More than one in three kids admit to having concerns about their family’s personal finances. Let’s be honest, not too many people enjoy talking about money. Financial issues have been known to cause tons of stress, fights among married couples that end in divorce, and create an uncomfortable feeling of uncertainty that shakes you at the core. And, adults aren’t the only ones who worry about it. The University of York released The Children’s Worlds study that takes a look at how kids around the globe view life and their own circumstances. Researchers specifically wanted to hone in on areas that include personal well-being, school and home life, happiness, and money. While the majority of children surveyed admit they are pretty happy, one major area of concern, however, appears to be their household’s finances. More than one-third of kids have expressed frustrations about money, and whether or not their family has enough. “Money is one of those words that has a lot of charge; and typically, that charge is very negative,” says Christy Whitman, parenting expert, life coach, and author of The New York Times bestseller, The Art of Having It All: A Woman’s Guide to Unlimited Abundance. “You may not tell your kid that money is bad, or there is not enough in so many words, but they learn it through how you feel and interact. Opening up to your kid about your personal finances can be hard, and also, a double-edged sword. On one hand, parents do want to have some sort of dialogue about money and it’s value—even if it doesn’t cover the depths of your bank account. Mary Kaarto, author of Help for the Laid Off, was once a single mother who experienced long-term job layoffs not once, but twice. Nervous about the negative impact it would have on her daughter who was young at the time, Mary did her best to create as stress-free of an environment as possible, that also reiterated the value of a dollar. Now a wife and mother herself, Mary’s 34-year-old daughter says she never forgot the life lessons her mom taught her, even in the face of adversity. So, when should parents talk to their little ones about finances? And, how can we reassure them that things will be okay? Given that children are thinking about their parents’ money in some way, there’s got to be a solution that opens the door to questions and discussion; without unlocking the entire vault. To help get the ball rolling, Christy Whitman recommends parents consider these five tips. 1. Have a general discussion about money sooner than later. 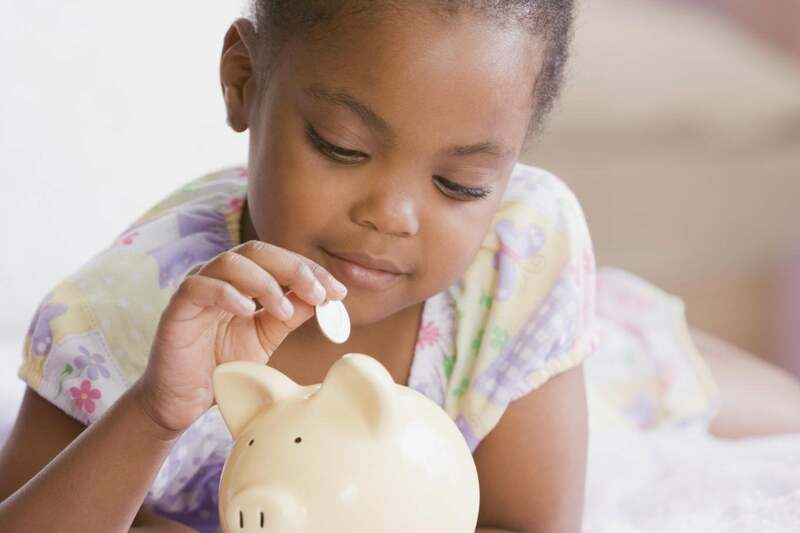 Whitman says if your child is old enough to understand not to put certain things in his or her mouth, you might want to consider introducing kids to the concept of finances before they come to their own conclusions. “Tell them that money is valuable and what it means to you,” advises Whitman. 2. Consider an allowance. One of the easiest ways for kids to learn about money (and its value) is with an allowance. Purchase a piggy bank for your little one where you can insert money whenever a chore or something of importance is completed. 3. Listen to your comments about money, and whether or not your tone is too pessimistic. “Parents need to be aware of their own negativity around money because children pick that up,” cautions Whitman. Though certain areas of discussion might be too mature for a child, Christy Whitman urges parents to try and keep explanations about finances from being too negative. If a toy for example is too pricey, think of ways to tailor your response that lets your child know he or she can’t have what they want right now—and doesn’t paint money out to be what Whitman calls “a mysterious and scary monster.” If you’re anxious about money, there’s a good chance your child will be as well. 4. Don’t project your money issues onto your kids. This is a biggie. Your outlook on money will influence how your child sees it. Parents should be careful how they address any lack of finances as it could give off a certain energy that screams limitations, and thus, makes your kid frantic about their family’s well-being. 5. Take a look at your personal relationship with money. It’s always a parent’s goal to provide for his or her child that enables the future professional to succeed in life and achieve all dreams imagined. One of the best ways to help ensure your son or daughter has a bright and successful future is to take a hard look at your relationship with money—and ask yourself whether or not you want your kid to have it, too. Should the answer be no, hopefully you can make any necessary changes that will help influence the next generation.